Journey to Justice (JtoJ) galvanises people to take action for social justice through learning about human rights movements and the arts. We are a volunteer led human rights education charity with supporters all over the UK. The story of Journey to Justice began in 2012 when Carrie Supple visited the Little Rock Central High School National Historic Site in Arkansas, USA. She heard recordings of African American parents who chose to send their children to a formerly all-white school there in 1957, despite the danger. She was moved by how they risked their homes, jobs and lives in doing so and she wanted to tell those stories in the UK. There was tremendous support for the idea and in October 2013 Journey to Justice was born, created by people who believe in the power of 'ordinary people' to change the world. We are caught in an inescapable network of mutuality, tied in a single garment of destiny. Whatever affects one directly, affects all indirectly. Dr. King’s call for solidarity is a message that transcends time, place and issue and is evoked by people fighting for social justice on every continent. 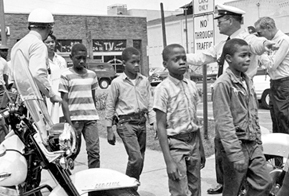 Our main project is a touring exhibition focused on the US civil rights movement and its music which tells the extraordinary story of some of the less well-known women, men and children involved. We also highlight some of the many struggles for freedom in the UK. The exhibition and related activities examine key events, themes and tactics, demonstrating what leads people to become and stay active in campaigns. We illustrate how the US civil rights movement has affected people in the UK, and worldwide and helped inspire subsequent women’s, peace and gay liberation movements. As the exhibition travels, it links with local communities, incorporating lessons from UK campaigns for freedom, equality and human rights. Using arts and intergenerational activities, we show how change for social justice can happen led by ‘people like us’. Dr. Paul Stephenson, OBE, community worker, civil rights activist and leader of the successful 1963 Bristol Bus Boycott against the colour bar and Jean Stallings, civil rights and anti-poverty activist. Please see our management committee members and advisers. Volunteer Stories – polaroids and paper clips and with many thanks to our volunteer Claire McLoughlin who researched and collated the stories. Read a Q and A in the Museums Association online journal about our work here. Our travelling exhibition has been to: Newcastle-upon-Tyne, Sheffield, Middlesbrough, Sunderland, Tower Hamlets, Lambeth, Nottingham, Bristol and is now in Newham until the end of April (see Projects Drop Down for details). Next it's Dorchester, Liverpool, Islington, Birmingham and Leicester and we're in discussion with partners in Stockton, Brent, Devon, Sussex, Kingston, Croydon and Leeds. In each place a local team researches and curates a section of the exhibition dedicated to telling stories of local human rights histories. And we offer bespoke training for all ages in a range of settings. Read about some of our projects and partnerships here. 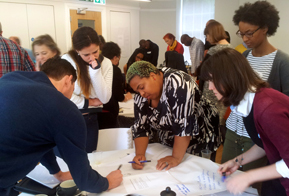 See write-ups and photographs from our events and team days here. 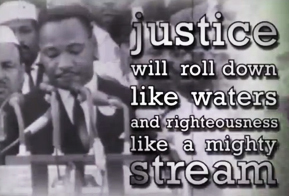 Watch the first film from Journey for Justice; a speech by Martin Luther King on accepting his honorary degree from Newcastle University, 13th November 1967. With special thanks to Exposure and see some of the films about our exhibition and projects. We place the arts – songs, literature, poetry, films, dance – at the heart of this project. Workshops accompany the exhibition, planned by local teams, led by specialists (in history, social change and the arts of social justice) and include the performance and teaching of songs for human rights in order to learn from them and experience the strength, joy and communal sense of freedom they inspire.